next up in the contra series for me was contra III: the alien wars for SNES. [back to back SNES games? what’s the world coming to??] like many other franchises that originated pre-SNES, contra 3 really feels like a leap forward, with a huge improvement in the graphics and sound. the core gameplay is as solid as ever, although my enjoyment of the game was hampered by the lack of a 30-man code (which, completely mystifyingly, was in the original japanese release but was removed for the north american release). the game’s options allow you to set your lives to be up to 7, and as a series first it includes three levels of difficulty. aside from this significant handicap (although perhaps this is just konami’s way of telling us we’ve gotten to expect too much coddling from the other contra games), the game unfortunately has a few other issues as well. there’s an impressive number of boss and sub-boss battles, but some of them require far too much “try and die” playing; the last boss is a particularly egregious example. the game also includes two top-down levels, which have never been a strong point in the series for me, and they’re similarly dull here. there’s also a stage that takes place on motorcycles that is a great idea that could’ve been better executed. despite this niggling, the game is a definite classic. there’s a lot of variety within each level and the additions to the gameplay are great, and the game features numerous set pieces, including navigating rails with one arm and shooting with the other; all the weapons are wholly worthwhile (now featuring bombs, the new flamethrower, and the ability to switch between two weapons); and the co-op gameplay is as much fun as ever, although, again, the enjoyment is hampered by the game’s difficulty. the action gets pretty intense, although there’s rarely any slowdown. all in all this is an SNES classic that, despite its difficulty, is a definite high point for the series. looking to the future it seems that many of the subsequent releases were less than impressive, but it will be interesting to see how the series has evolved. 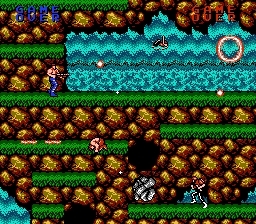 my SO and i play games together occasionally, and a while back we tried out contra 3. that game turned out to be too difficult, though, even with the 10-man code, so recently we sat down to play the original contra for NES. the infamous konami code provides 30 lives, and since i have the game practically memorized we were able to make it through to the end even though his skills are, shall we say, somewhat lacking. 😉 the ability to steal lives from the other player when yours run out definitely came in handy. although i lost more than a few lives this time around when i went back and played it solo, it really wouldn’t be too hard for me to manage a perfect or near-perfect run. so it seems a bit surprising to me that people still consider this to be one of the hardest games of all time (that is, without using the cheat code), but i suppose i’ve just forgotten how many times i had to play through the game as a kid to memorize it. super C and operation C weren’t too challenging either, but already i can tell contra 3 and contra 4 are going to be more difficult, just from the small tasters i’ve had of them. in evaluating the game, i’m faced with the ol’ nostalgia vs objectivity issues. but even objectively speaking the game stands up extremely well, and the graphics, music, weapons, explosions, and level and boss variety make this one for the ages. it feels a bit short nowadays, but the game really makes the most of its limited gameplay with its eye-catching locales and a ton of enemy and environment variety. i think the waterfall level ranks among my top favorite levels ever, and the games features some of the best co-op play ever as well. an enduring classic, and one that still deserves a top spot on any “best games of all time” list. – PDF of the manual at replacementdocs.com. has some great lines like “if you succeed, well … it doesn’t matter, because i doubt you will”, and “believe in miracles maybe you’ll make it”. haha. – speaking of lists of top games, contra is currently an entry in the ongoing series of polls i’m running to highlight some of the greatest games of all time. check it out here. i played through the GB contra game, operation c, a while back, but to continue on with the series i went back to the original’s NES sequel super C. as i noted with operation C, super C sticks very close to the original’s outstanding gameplay, and thus there’s not a whole lot i need to say about this installment. super C was the first to replace the original’s pseudo 3D-levels (which i quite liked) with top-down levels (which i rather dislike), although at times the top-down levels feel a bit more awkward here than in operation C. and although i enjoyed it overall, somehow the game lacked some of the polish of the original. part of my feeling is no doubt due to the fact i haven’t played the original in ages, but as an example compare the level design of the original game’s first stage, which featured an upper and a lower path, with this game’s jungle stage which features one path and long stretches of repetitive backgrounds. (for maps of the levels for both games, check out the fantastic vgmaps.com.) also, i have to agree with the review at vc.nintendolife.com that the game feels noticeably easier than the first one, even given the fact the first featured the infamous 30-man konami code whereas this one just includes a code for 10 men. the bosses did seem to have more variety, though. once again i was also struck with the feeling that the difference between how difficult the game is when you have the spread gun and when you don’t is so huge it makes the game feel rather stilted at times. but there’s no doubt that this and the others i’ve played so far in the series are fun run-‘n-gun classics, esp. in co-op mode. it’s been ages since i’d played a contra game, but since the original NES classic was one of my favorite games of the era i was eager to get back into the series. i happened to start off with operation C, the first game boy contra release, which came out after the NES contra sequel, super C.
the game is a contra game through and through, so there’s not a whole lot to say. it’s made easier than most of the other games in the series thanks to a level select code, and the introduction of the homing gun makes the game a breeze for as long as you can manage to keep it. i didn’t mind the lack of 2 player co-op, but i wasn’t too into the substitution of the pseudo-3D levels of the original with two top-down view levels (a change that was apparently introduced in super C). but other than that this was typical run ‘n gun contra bliss. graphics and music, all heavily indebted to the original NES game, are all great. 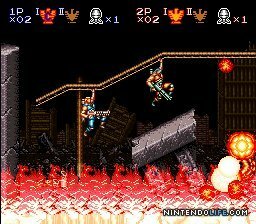 i’m definitely going to have to tackle super C next, although i played through the demo of the fairly recent release of contra 4 on the DS (thanks to the wii’s nintendo channel) and it looks fantastic. but i got spoiled with op C’s level select, so whatever contra game i play next will be more of a challenge. two links are all you need to accompish your mission!